If you know your crystal -- as in stemware, crystal decanters, footed bowls, salt, pepper and sugar containers -- the Stuart name stands out above the rest. First manufactured in England in the late 1880s by Frederick Stuart and, later by his sons, the company was successful right up until 1995, when it was purchased by Waterford Wedgewood. It was only six years later that Stuart Crystal ceased production and closed its doors forever. British crystal maker Frederick Stuart purchased the distinctive Red House Glass Cone -- a conical brick structure for making crystal and glass -- in Wordsley, England, in 1920. But by the time he acquired this famous building, he had already been manufacturing crystal glass ware there for nearly 40 years -- leasing it from the Red House Cone Glassworks Company. In 1924, he began etching the name Stuart into the items the company manufactured, and by 1927, Stuart Crystal had become the trademark name for the high-quality items such as footed crystal bowls and decanters for which he and his sons became known. 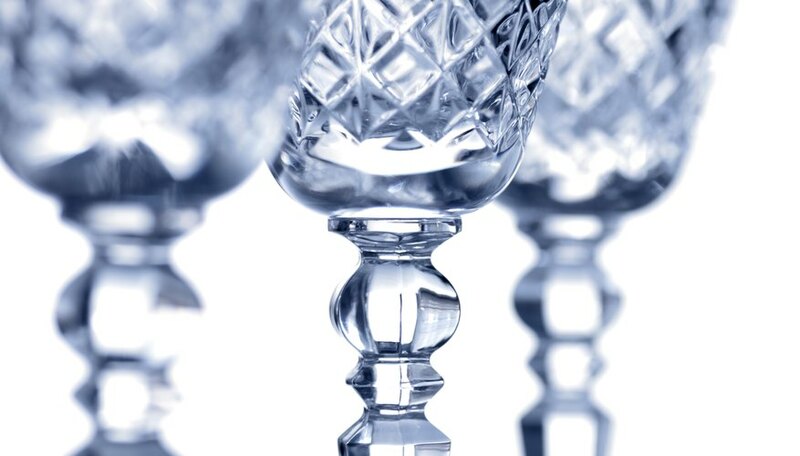 Throughout the history of the company, multiple stunning crystal patterns were developed, from the company's patented Medallion Glass Cameos on scent bottles, decanters and bowls to the diamond-and-floral motif of the Beaconsfield design created in 1907 for flower vases, wine glasses and more. Later variations saw the manufacture of everything from art nouveau clarets, light bulbs during wartime, cocktail sets and table services -- all in too many patterns to mention. Characteristics of many Stuart crystal pieces include the inclusion of the 24-cut star on the base, cut diamond and small fan shapes along with the name Stuart etched on item bottoms. Many skilled artisans worked on Stuart crystal throughout its history, including engraver Ludwig Kny, who joined the company at the conclusion of World War I. Kny brought with him the knowledge of intaglio printing, adding colorful curved lines to Stuart's previously straight cuts. It was during Kny's time at Stuart Crystal that color was introduced into the pieces via enameling. Using this method, intricate motifs such as colorful butterflies could decorate perfume bottles or crystal stemware. Stuart enamelware was expensive and beyond the reach of most average consumers of the era. But today, these items are sought as prized collectibles. If it could talk, the magnificent, detailed crystal produced by Stuart would have many great stories to tell. It was aboard the Titanic when she sunk, and it sailed with the Queen Mary in the 1930s. Stuart Crystal made special stemware, brandy and wine decanters for use on the Titanic, which included the White Star Line logo on some of the items, later replicated and reproduced again in the '90s. Today, Waterford Wedgewood still uses the name Stuart on some of its crystal. Fenton Glassware- What Is it Worth?